Democratic Sen. Kamala Harris's (Calif.) campaign is renting office space from a small travel agency on Capitol Hill in Washington, D.C., Federal Election Commission filings show. Harris's campaign committee, Kamala Harris for Senate, has paid $10,000 in rent so far this year to Carroll Travel, an agency that specializes in corporate travel for congressional offices and luxury Caribbean travel that is located minutes away from the Capitol building. A $6,000 payment was disbursed from the committee to Carroll Travel in February. Between April and June, $4,100 in payments went to the agency. When asked about their office space, a Carroll employee told the Washington Free Beacon that they have an office but have been working from home. The employee said they "think" someone is in there and then transferred the call to her boss, Stuart Carroll, the owner of the company. "I am not going to address my private business dealings," Carroll said. When asked if he could verify if he was renting his office to Harris's campaign, Stuart again responded, "I'm not going to discuss my private dealings with you." The Free Beacon went to the office building and found that Carroll Travel is no longer listed on the main floor directory. No one answered the door of Carroll's unit and the surrounding businesses on its floor claimed they did not know anything about the agency. However, an employee from a business located downstairs said that they believe that Carroll had moved out and someone else was renting the unit. 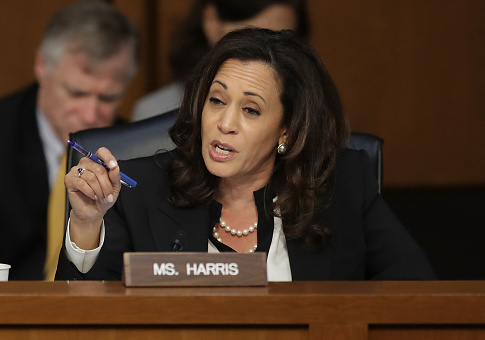 A presidential campaign veteran told the Free Beacon this appears to be a move that would allow Harris to more easily conduct political activity while in D.C.
"Given the current political landscape and state of constant campaigning that we're in, it's not surprising that someone with clear presidential ambitions would open an office where they can hire operatives, raise money, and grow their footprint," they said. "It's clear she thinks she is a national figure and wants to become a national candidate, but that comes with risks. Constituents don't like to be neglected by their elected officials and if she ignores issues directly affecting California so she can focus on the news of the day in D.C., there will be backlash." Harris would need the separate office space to perform campaign-related activity, which is strictly prohibited in congressional offices. The Senate Ethics Manual states that offices may only be used for official purposes and that no campaign activity can occur in a federal building. Senate members and staff also may not receive or solicit campaign contributions in a federal building. Harris's campaign did not respond to inquiries about why the campaign was renting an office on Capitol Hill, 2,800 miles away from her home state. The California senator, who was just elected to Congress in 2016, has been floated as a potential candidate for president in 2020. Harris has mingled with former top donors to failed presidential candidate Hillary Clinton in the Hamptons in recent weeks. "She's running for president, take it to the bank," one donor told the Hill. "She's absolutely going to run." The Democratic senator has also attended meetings with Harvey Weinstein, a Hollywood liberal and longtime Clinton donor, and a reception at the home of Charles E. Phillips, the CEO of Infor, a software company located in New York City, in addition to others. Harris's campaign has also paid $400,000 to the media firm that boosted Sen. Bernie Sanders's (I., Vt.) national profile during his run against Hillary Clinton in the Democratic primary so far this year, the Free Beacon previously reported. Harris has also added a number of former Clinton campaign veterans to her Washington, D.C. office. Harris and her staff have countered the speculation by saying that she is not thinking about running at the moment. This entry was posted in Issues and tagged Kamala Harris, Senate, Senate Democrats. Bookmark the permalink.